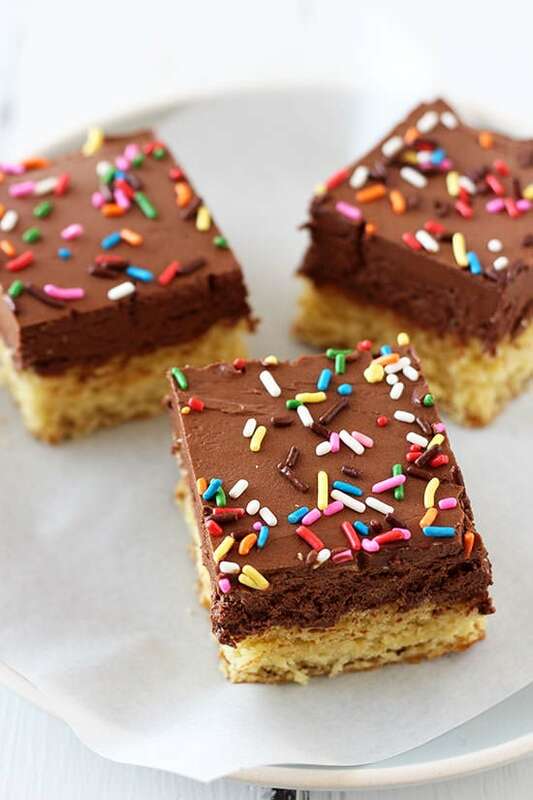 Chocolate Frosted Sugar Cookie Bars are soft and chewy with an ultra thick and creamy layer of homemade chocolate frosting topped with sprinkles. Taste: Like a sugar cookie meets a birthday cake with lots of cocoa chocolate frosting. Texture: The sugar cookie bars are soft yet chewy while the frosting is ultra thick, rich, and creamy. Appearance: I just love the sprinkles on top! They make this recipe fun for any special occasion. Pros: Fun and playful dessert that’ll take you back to your childhood. Perfect for small celebrations! Cons: None, just not health food. When making sugar cookie bars, is it pure evil to pile on a layer of frosting as thick as the cookie bar itself? If so, I may be the devil. 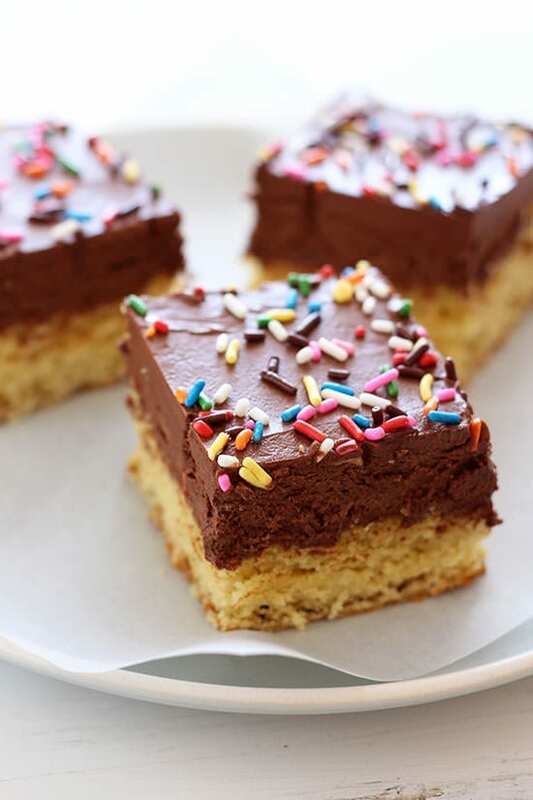 Today’s recipe for Chocolate Frosted Sugar Cookie Bars is everything you could want in a bar dessert. They’re soft and chewy, thick and creamy, with all the flavors and colors of your childhood. They’re perfect for celebrating any occasion, or just baking up a batch for fun. Today’s recipe is in celebration of Sally from Sally’s Baking Addiction and her upcoming wedding. Happy virtual bridal shower! I know the majority of you know Sally not just because she has a fabulous blog, but because every time I ask you guys what other food blogs you read you always tell me Sally’s! I can see why, between her crazy awesome baking recipes and lovely personality, she is such a fabulous member of this huge food blogging community. A bunch of us bloggers are sharing recipes today for Sally’s virtual bridal shower and the theme is SPRINKLES. How fun is that? 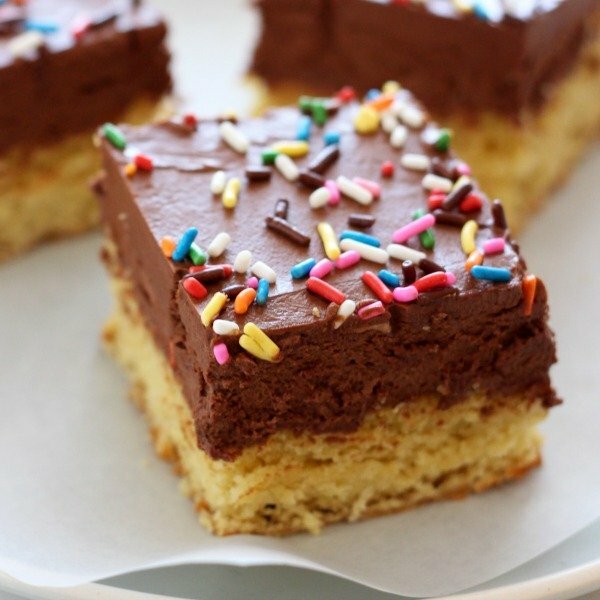 Sally, I know you’d love these Chocolate Frosted Sugar Cookie Bars and I so wish I could share them with you in person! You are going to be a gorgeous bride and I wish you and Kevin many years of joy (and sweet treats). Congratulations! Scroll down below the recipe to see what all the other bloggers participating brought to this virtual bridal shower. If you make this recipe, be sure to take a picture and tag it #handletheheat on Instagram. Sprinkle party! Preheat the oven to 350°F. Line an 8 by 8-inch baking pan with foil, leaving an overhang on all sides. In a medium bowl, whisk together the flour, cornstarch, baking powder, baking soda, and salt. In a large bowl, use an electric mixer to beat the butter, cream cheese, and sugar on medium-high speed until well combined and smooth, about 3 minutes. Add the egg, egg yolk, and vanilla and beat until combined. On low speed, gradually add the flour mixture and beat until combined. Press the dough into the prepared pan. Bake for 25 minutes, or until lightly golden brown on top. Place the pan on a wire rack and let cool completely. In a large bowl, use an electric mixer to beat the butter on medium-high speed until creamy, about 2 minutes. On low speed add in the powdered sugar, cream, vanilla, and salt. Increase speed to high and beat for 3 minutes, or until light and fluffy. Remove the bars from the pan using the foil overhang. Frost with a thick layer of frosting. Sprinkle with sprinkles before cutting into squares. Serve or store in an airtight container at room temperature for up to 2 days or in the fridge for up to 5 days. This is the BEST bridal shower anyone could ever ask for. All of my best blogging buddies together to celebrate. I always thought virtual blogging parties were the sweetest thing, and now I have all of my bests doing it for me. I can’t thank you enough Tessa! I just read that your readers love my blog and that almost brings tears to my eyes. I look up to you so much and have since I first started blogging. Maybe one day you can teach me how to make one of your amazing recipe videos. Because anything I try is embarrassingly awful. These sugar cookie bars are a dream come true. I’ve only ever made something similar with vanilla frosting but chocolate sounds (and looks) even better. You know me too well! 🙂 thank you again Tessa!! That frosting looks wonderful, Tessa. I want some for breakfast NOW. Whoa. Now THAT is frosting! Those look amazing, Tessa! Love these cookie bars! The frosting looks crazy good, Tessa! OMG!!! Pile on that frosting, why won’t ya?! hehe I LOVE IT!!! These look incredible and the perfect addition to the bridal shower! I love reading all the support and recipes inspired by her shower and the theme “sprinkles”. love that big ol’ layer of frosting! yum!!! Thank you! So happy to have you Del! I would seriously INHALE these!!! Gorgeous! How positively decadent!! I’m in chocolate frosted love here! Omg Tessa these are so perfect for a Sally celebration! LOVE that frosting! I think that cookies should always have a thick layer of icing! I love a good sugar cookie bar and these look awesome, Tessa. I love the thick chocolate layer! Hey! I am making these for a get together at my house tomorrow night; there will probably be about 18-20 people. Do you think I could double the recipe and make it in a 9×13?? These sound amazing. And the frosting looks like pure fudge. Pinned! Made these for a bake sale and they sold out so fast! This recipe so extravagant:) I made these chocolate frosted sugar cookie bars for the super bowl party and it was a crowd favorite. I’m also gonna pin this post on my Pinterest board my followers will love it. Thanks for sharing, Tessa! Oh my! These chocolate frosted sugar cookie bars were delicious and so easy to make! Will have to try this for my family. Thanks so much!